More serious: Absolutely right. The Laws of Nature prove that Jesus didn’t rise from the dead. Well, not naturally, anyway. But the resurrection of Jesus isn’t claimed to be a natural event. That’s kind of the point of miracles, isn’t it? If miracles we’re natural occurrences, they wouldn’t be miracles, right? What Mike said. There’s a chapter in “Miracles” by C.S. Lewis about this. He argues that miracles are not violations of the laws of nature. Miracles are events in the natural world whose causes are not natural. The laws of natures describe how nature interacts with itself, and nobody claims that nature could produce a resurrection on its own. The claim is that God raised Jesus from the dead. Once God interacts in the world, the laws of nature accommodate whatever causal chain God initiates. Do Laws of Nature Apply to God? From the shaded section… it seems as though you would be speaking to an atheist/agnostic or for this matter any person opposing a procreation worldview. I would suggest to the atheist that his “beliefs” are outside of science. For example, let’s examine the “big bang” and try to explain it scientifically. One might want to stay away from the law of biogenesis, cause and effect, 1st and 2nd laws of thermodynamics since all would quickly require evolution to consist of miracles (keep in mind they have no magician). Evolution has no answer and contradicts each of the above laws of science. The Bible on the other hand agrees with each of the laws. However, neither model (creation or evolution) can be proven scientifically and both must be accepted by faith. However, the Bible maintains a reasonable faith. Evolution is based on a blind faith. Evolution requires miracles with no miracle maker. I would argue that it is possible for someone to be resurrected since there are accounts of this outside of the Bible, over 400 eyewitnesses, no body on earth, and other provable facts. A miracle by definition is a surprising and welcome event that is not explicable by natural or scientific laws and is therefore considered to be the work of a divine agency; furthermore, it is a highly improbable and extraordinary event, development, or accomplishment that brings very welcome consequences. For more information about the resurrection I would suggest Lee Strobel’s The Case for the Real Jesus. Challenge #3. For your sake, God became the man, Jesus. In itself, that’s as miraculous as Jesus rising from the dead. What you can see today is the country of Israel. The people of ancient Israel were God’s chosen people who were ancestors of Jesus. The history of Israel involves many miracles that brought them to where they are today. In other words, Israel is proof of miracles as explained for us in God’s history book, the Bible. Oh, I just had a conversation with a guy about this. Goody. I think there is a false dichotomy here, that you either have to believe in science or you have to believe in miracles. I believe in both, and the universe hasn’t yet imploded. But I guess the first columbo would be useful, asking what do they mean when they say miracle. I wouldn’t necessarily say that a miracle is a violation of the laws of nature, as the objection would seem to imply/assume. Rather, I like the definition Antony Flew gave (and hopefully appealing to an atheistic philosopher [for most of his life anyways] will be more effective) which is something like, an action that would not have happened given the certain circumstances. So like when Jesus turns water into wine. Technically, there is nothing miraculous about water turning into wine. It happens all the time. That’s how it’s made. But when Jesus did it, given the circumstances, it would have been impossible (if using “impossible” doesn’t beg the question) for water to turn into wine so quickly the way it did. Thus we call it a miracle. So that would be my definition of a miracle. So that should weaken the idea there there is some kind of mutual exclusivity here between a miracle and science. Secondly, “we know the laws of nature”. Maybe we do, maybe we don’t. I would argue, however, that what we call a law is based solely on inductive reasoning. We call laws based on repeated experience. If I were to bounce a ball a million times, and a million times, it comes up, I induce that if I bounce it again, it will more likely than not bounce back up. But we are constantly adding to the knowledge and data of science, and science is always changing. So do we know the “laws” of science? Not deductively. So if you are to say that a miracle is a contrary to science, this would be false, since a miracle can then be defined as a part of the universe we simply haven’t fully considered into the inductive data of science. Thirdly, the resurrection. Our claim is not that Jesus rose naturally from the dead. But that God raised him supernaturally from the dead. But the question is does the supernatural/miracles happen? So it would erroneous to put the resurrection as a natural event. Fourthly, what is so astonishing about the Son of God coming back from the dead? If he truly was who he said he was, then why would such an action like the resurrection be hard to believe? So we look at the evidence for the resurrection without the presupposition of the impossibility of miracles, and I am confident that this person will be converted by that evidence. Give him Strobel’s Case for Christ, or something. I dunno. On top of what has already been said and the circular reasoning in coming to the conclusion, I think you could ask the question, “if it didn’t happen why does all the evidence point to the resurrection of Jesus as the only conclusion that adequately explains the historical facts?” I think this question then leads naturally into the minimal facts argument for the resurrection as done by Mike Licona and Gary Habermas. The fact of the matter is that if God exists, which I believe is well established by the natural laws of theology, then the greatest miracle of all already occurred– the creation of the universe! God normally operates in accordance with the laws of nature, but as Brett said, miracles are to be expected in a universe with a divine creator. No one is disputing that people can rise ‘naturally’ from the dead. 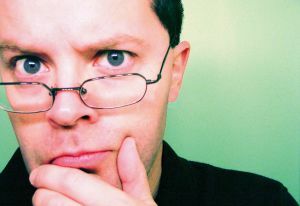 We should look to the simplest explanations first– ones in accordance with the laws of nature– according to Occam’s Razor, but when all naturalistic explanations have been ruled out (being less plausibly true than a supernatural explanation) and it is plausibly true that a supernatural explanation is the cause, a miracle must be concluded. Most astonishing events are simply that– astonishing, but explainable by the laws of nature. Some, however, undoubtedly are works of the supernatural.